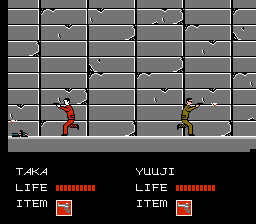 Mottomo Abunai Deka is an action game for the Nintendo Entertainment System. 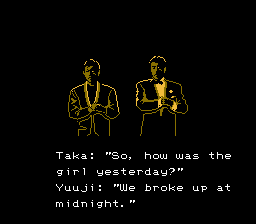 The game is based on a Japanese TV drama show. The game is a 2D 1-2 player side scroller. 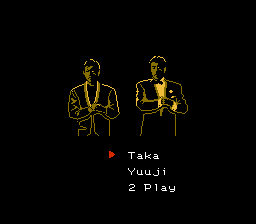 You the player control Taka or Yuuji, or both of these characters at the same time. 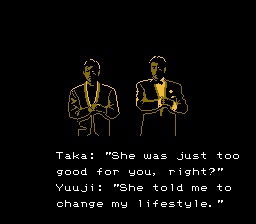 You’ll find yourself up against many enemies of the Yakuza gang, “The Silver Stars”, and then later on leading you to corruption within the police department and to the main villain at the end. While playing the game you’ll also run into three mini-games, which are a shooting gallery, a fast paced car ride and a shootout with one of the boss enemies. While playing the side scrolling part of this game, if you want to switch weapons, press start and then A to cycle through the selection. 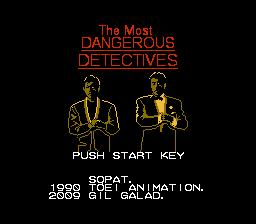 The original name of the game is Mottomo Abunai Deka, which has been retitled as The Most Dangerous Detectives. All of the text has been translated to the best of my knowledge. The main issue with the text is that there is a scrolling issue that has been worked out as best as possible for now.